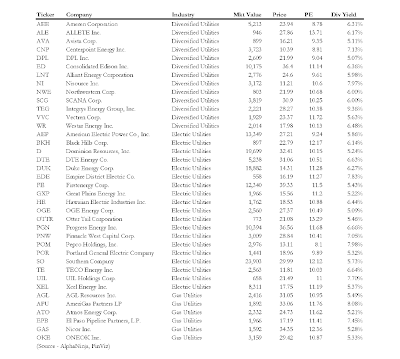 AlphaNinja - Bloomberg points out that some astute investors are picking up shares of unloved utilities, as relative dividend yields are way above normal. "Power producers are offering the biggest dividends since at least 1995. Payouts by utility companies in the MSCI World account for about 5.18 percent of share prices, almost double the rate at the end of 2007, according to quarterly data compiled by Bloomberg. They have increased per-share dividends every year since 2001, the data show. That’s longer than any industry group except health-care companies, which have a dividend yield that is 43 percent lower. The yield from utilities is also higher than the 3.70 percent yield on 10-year Treasury notes. In the previous 14 years, utilities have paid on average 1.74 percentage points less than government bonds, Bloomberg data show. " "Paying for the rights would add $9 billion to MidAmerican Energy Holdings Co.’s costs over the next 20 years, Chairman David Sokol said on June 9." Utilities will pass on most of the increased regulatory costs to consumers, blunting the affect to their bottom lines. These yields argue for pretty good outperformance for this industry. A quick screen of utility yields above 5% resulted in 38names.